I purchased a broken watch on Ebay with the hope that I could get it working or modify it into a frankenwatch, but as I was taking it apart I thought why not see if the movement from another watch would work. 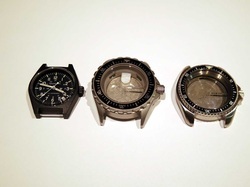 I have a relatively cheap, older watch with some tritium tubes attached to the face which would probably look pretty cool in the chunky case from the broken watch - well I actually have two candidate broken watch cases as you can see. Right now I am focusing on the case in the center with the movement, hands and dial from the plastic watch on the left. Also note that I have done some fancy photoshopping to protect the innocent here, I have read that the manufacturer of the plastic watch on the left does not like people changing their stuff, but heck I bought it - but I also don't want to ruffle their feathers either. 1. Getting a movement holder seems to be hit and miss, so it's best to try a swap that will work with the existing movement. 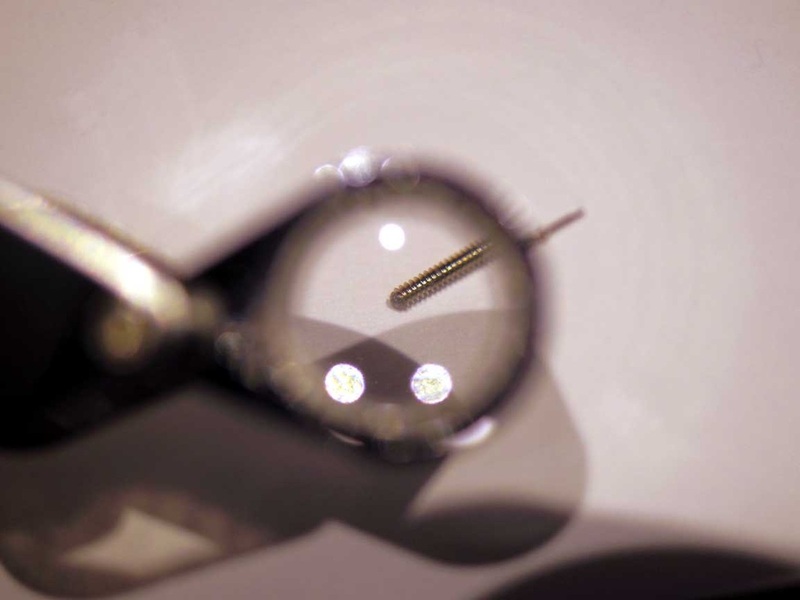 In this case the movement has a diameter of - 11 1/2 Ligne or 25.6 mm. I have no idea what mythical creature a "Ligne" is, but that surely shows my ignorance of all things Swiss. If I had to guess it is based on some long dead king's toenail clippings or some such nonsense, but it is what it is. If you get a different size, just have a way of holding the movement in the case (or make sure it is not too big for the case which seems unlikely with the watches I am using here). 2. The stem height has to match - this is the distance from where the movement face to the center of the hole where the stem (watch windy thing) goes through the side of the case. For the Ronda 715 movement in the metal case donor watch it is 1mm, and by happy coincidence it is also 1mm in the ETA movement from the plastic watch which will donate it's face and movement. 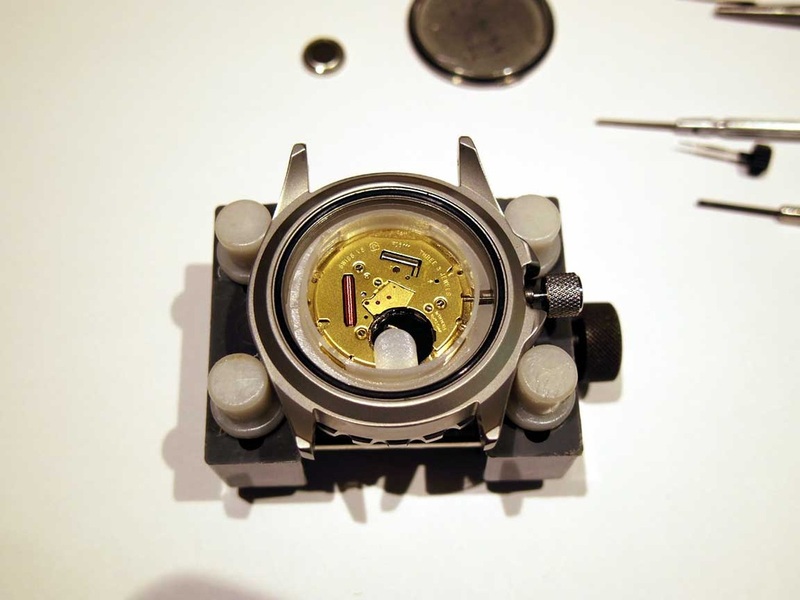 This seems to be the biggest problem for swapping a quartz movement over to something more fancy like an automatic mechanical movement, which seem to more commonly have taller stem heights. In my case I am swapping quartz for quartz, so far so good. 3. The height from the face to the top of the second hand post or "pinion" is also important - if the movement is taller than what will fit in the case, the second hand will either not move, or worse it could damage the movement by mashing the second hand pinion into the movement when the case is closed. There is one way to get some extra height on a case however - swap the crystal for a domed one. I'm not really sure what the best way to measure this is since I don't want to set my caliper on the face to gauge it. This also seems to be an area where there is a lot of variation between the same model movements depending on the watch. For a watch like these with thick hands (since they have the tritium tubes embedded in them), it gets tricker since they will bind if the distance between hands is not right. For example here and here are the data sheets for the Ronda 175 movement - the charts on the top right show the various configurations of the pinion heights. 4. If the hands will be swapped, the hole sizes need to match up between the old and new movements. I am not changing the hands however. So in my case I am swapping a ETA F06.111 (Quartz, 11 1/2 Ligne, 1mm stem height, with a second hand that extends about 2mm above the face - according to the datasheet) with a Ronda 715 (Quartz, 11 1/2 Ligne, 1mm stem height, with a second hand that extends less than 2.7mm above the face (2.29mm according to the most likely datasheet) - I could not tell on the Ronda since the seconds hand and post fell off the movement. Everything should work with the swap, but there is a problem which I will get to later. 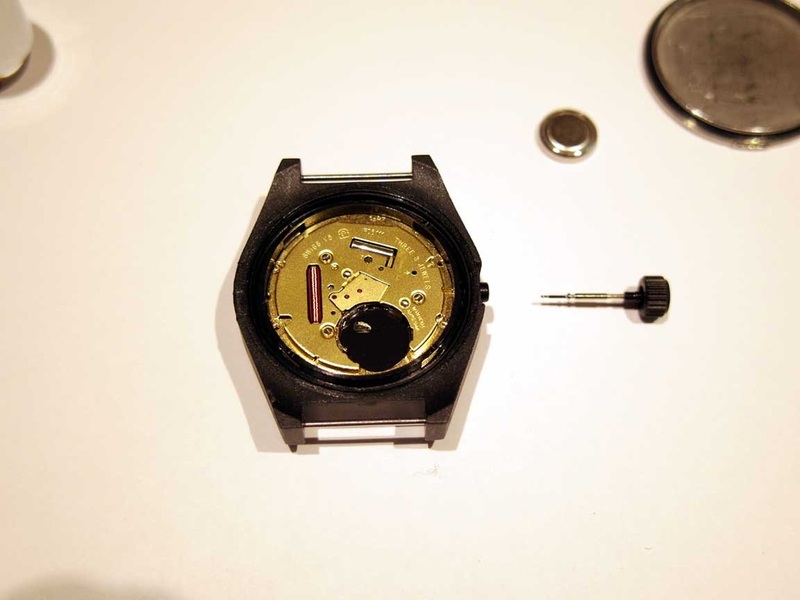 The first thing I had to do was disassemble the donor watches, either pop the case back off with a knife or unscrew the case and remove the battery. 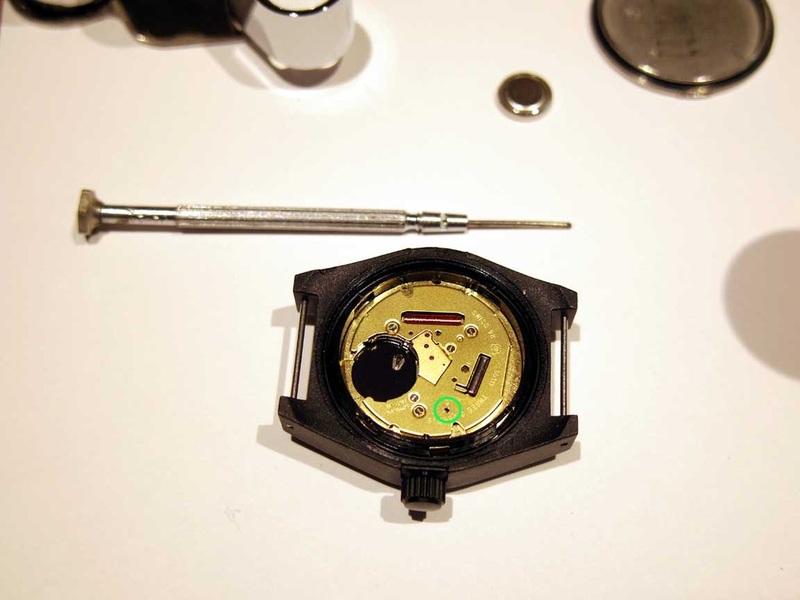 For the plastic watch, with an ETA F06.111 movement, the trick to getting the stem out is to put a small screwdriver or pointy end of a tweezer into the small hole where the green circle is in the pic on the left (there is an arrow scribed on the movement as well) - do this with the crown pushed in as it would normally be. It does not take any force, the tool is just blocking a lever so when you pull the crown out as if to set the watch, it will come all the way out with no force. My understanding is that it is important not to turn the crown while inserting it or removing it. To put it back in, just push it straight in, and it will click, again it does not take much force. Once the crown is out the movement, which is attached to the face and the movement spacer will fall out on a quartz watch, automatic mechanical movements have additional holding tabs which are held in with screws. Next up is the stem. 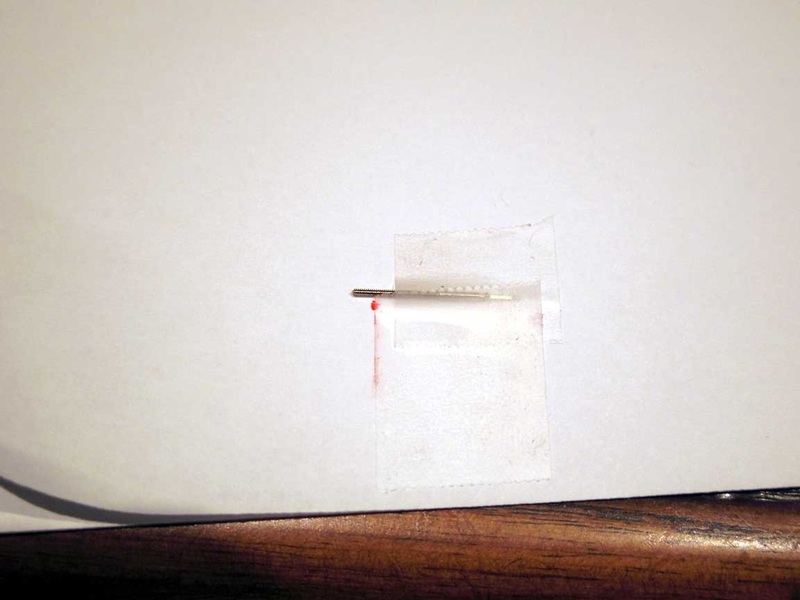 I cannot re-use the stem attached to the movement I just popped out of the plastic watch so I have to replace it. 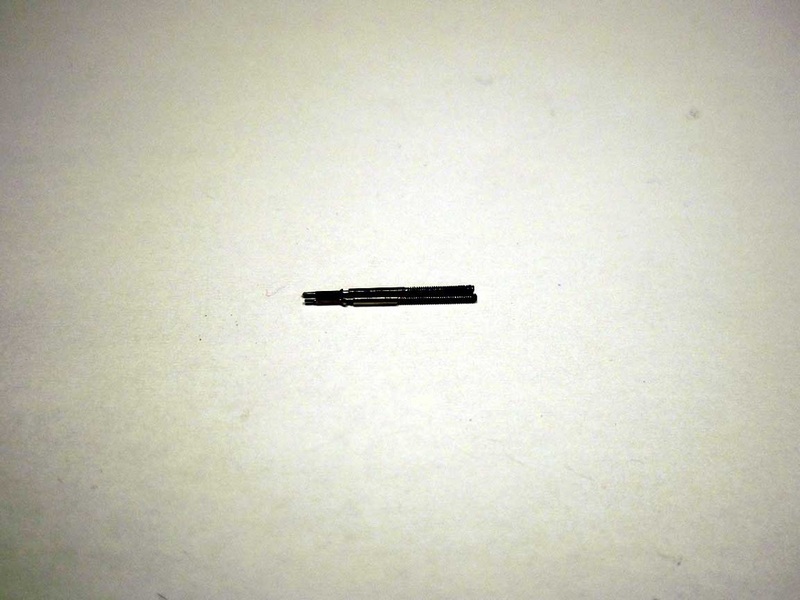 I bought a couple ETA stems which will need to be shortened (ETA part number 401-1519). 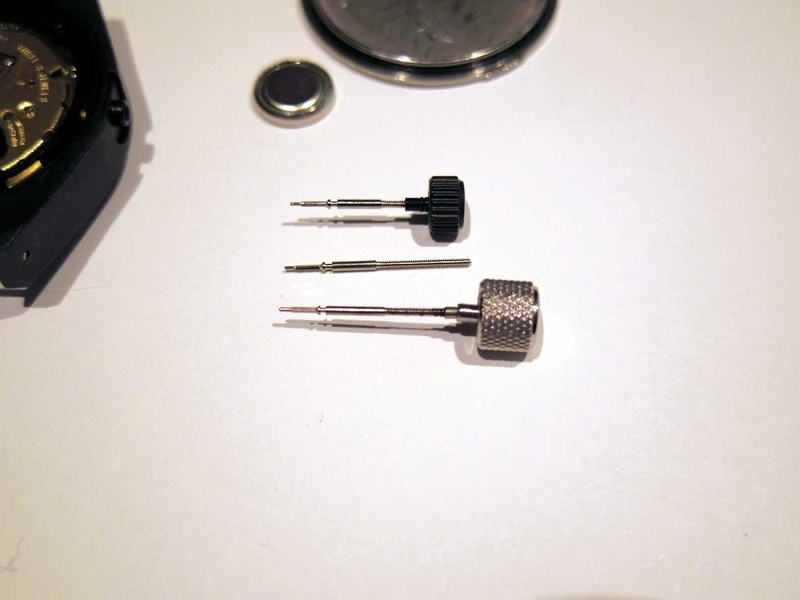 Below you can see the old stem with the black crown from the plastic watch (fits the gold ETA movement), the new ETA part which will need to be trimmed down (fits the gold ETA movement), and the stem from the donor metal case watch with the silver crown (fits a Ronda 715 Movement). But that leads to a second question - how do you get the old crown on a new stem - simple, it unscrews. But it is not that super easy and I probably did it all wrong, but I used a pliers and held the threaded part below where I knew it wouldn't matter, and then heated the crown with a few swipes over a candle. After that I just held the pliers firmly enough so the stem would not twist, and twisted the crown off the stem (sorry no pics). Then I matched up the old stem (top in the right side pic) with the brand new one so I could trim it down. 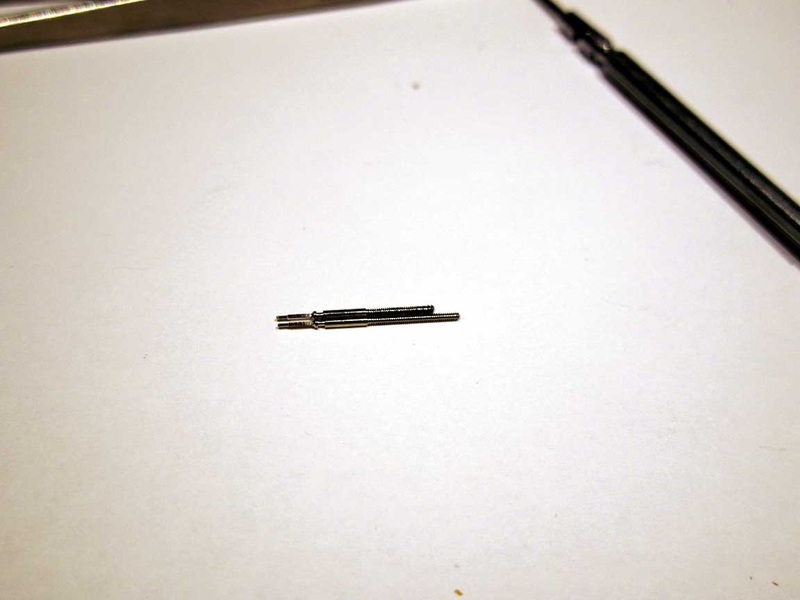 I've never trimmed a watch stem before, but the stuff I'd seen online says just cut it with some wire cutters and clean up the end with a "stone". 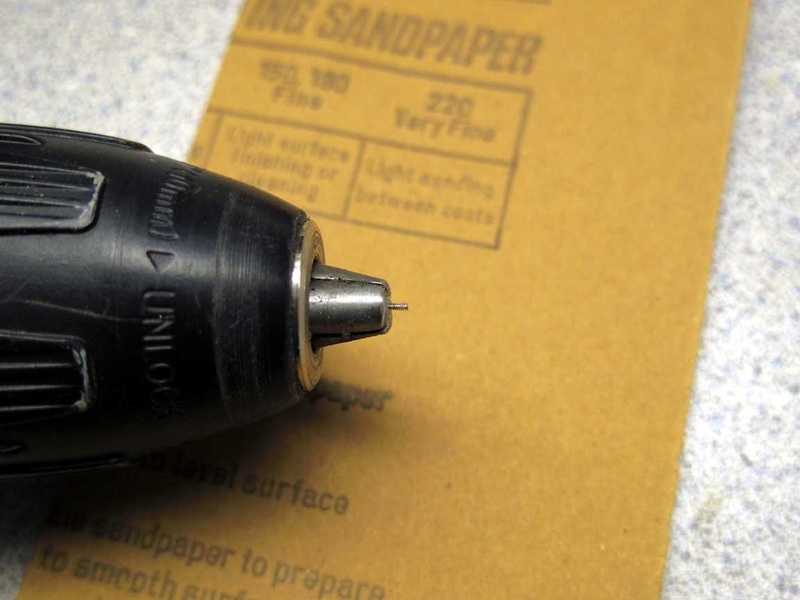 I am thinking a sharpening stone for a knife is what would work, but I could not find one around here so I just used some sandpaper. It worked but it is really important to clean up any grit left on the stem since it will really screw up the works. The pics below show how I cut the stem, I first had to mark it so I taped it down to paper, and took another piece of tape with a thin line on the edge from a sharpie and used that to define the cut line. 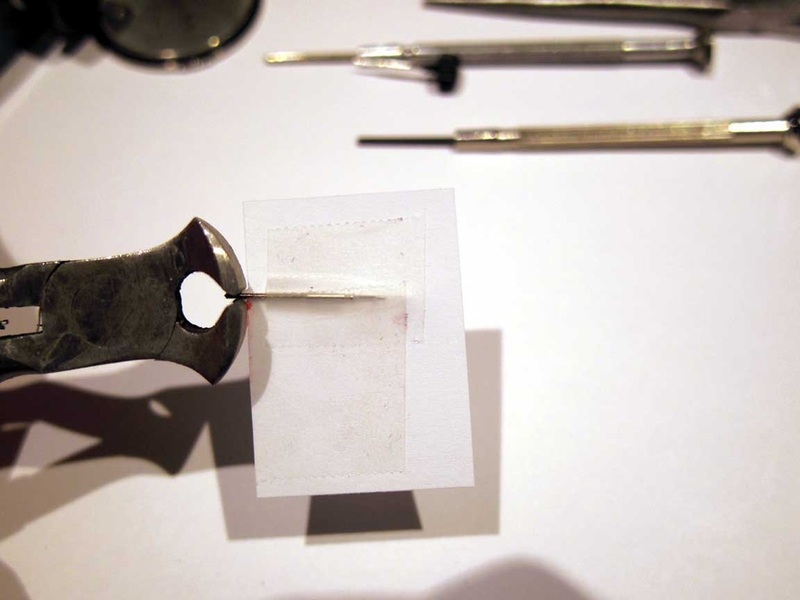 I then trimmed the paper to the cut line and snipped the stem with wire cutters. Next up I chucked up the stem in a drill and with it turning slowly, I wet sanded it to clean up the end. It is not the prettiest thing, but the idea is to make sure it will not cross thread into the crown. After the stem was sanded down (I had to sand it down a bit more to match up with the original one from the Ronda 715 movement), I just threaded the stem into the crown. One thing I should mention here is that the threading on the stems is not always gonna match up, but I may have lucked out, or it may be that there is some standardization at least among types of movements (Quartz or Mechanical) - I am not sure. 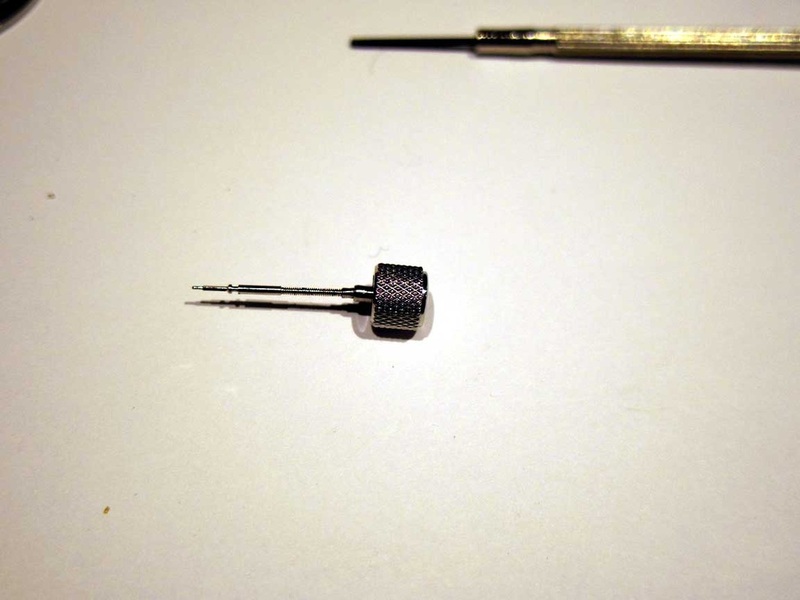 In any case, when I finally assemble this watch I will add a drop of thread lock to the crown. The last pic shows the replacement stem, the old crown in the old case with the donor movement, face and hands from the plastic watch (confused yet)? I have to stop here because the new metal case caused the donor ETA movement (gold colored one) to bottom out on the crystal, and the seconds hand did not move. I think the seconds hand may be sticking up just a bit so I am gonna re-attack this later to see if I can coax the seconds hand down a bit more. 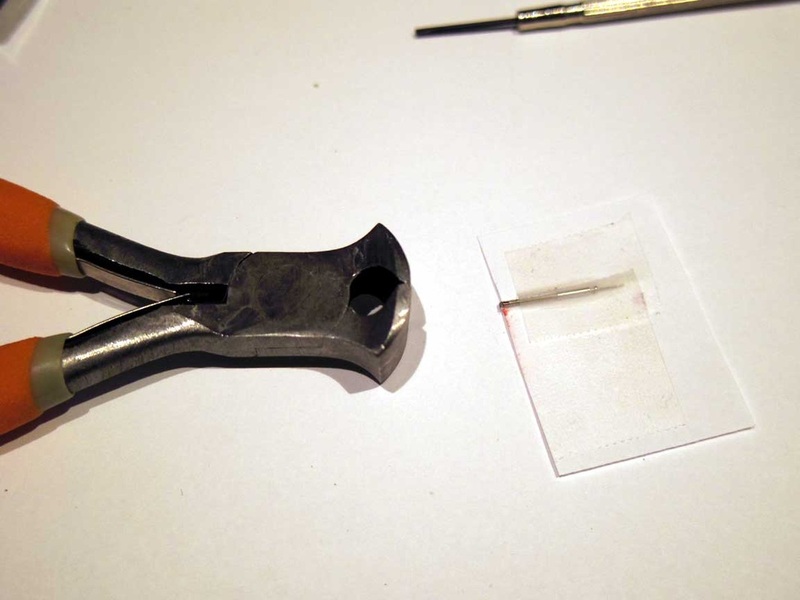 As a backup, I am also ordering a 2mm x 30.5mm domes crystal for it (the original flat crystal is 2.5 x 30.5mm) - but I think it will work since the original crystal has a slight bevel. The domed crystal will surely work and probably make it look better too. I am also considering swapping the works over to the other case I have around which would require milling up a movement holder since the movement which is original to that watch was a 10 1/2 ligne sized movement and I would want to swap in an 11 1/2 ligne ETA F06.111 movement.